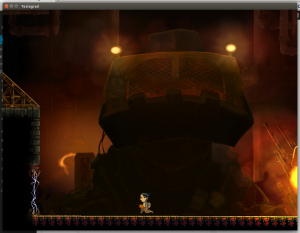 Teslagrad is a 2-D platform game with loads of fun puzzles which mostly revolve around electricity and magnetism. We, the player, are a young lad exploring a world full of robots, strange machines and electrical current. As we journey through various environments we turn to the rules of electricity, general physics and magnetism to help us solve challenges. When the game starts out things are pretty simple. We are alone in a room and we can practice using the game’s few controls, walking, jumping and climbing. Once we get the hang of our character’s movement we can start exploring the environment. Gradually we are introduced to some interesting creatures and challenges. There are streams of deadly current, magnetic fields we can use to move ourselves around and creatures which can produce a charge or be given a charge, affecting the world around them. Fairly early on we pick up an item which allows us to hit objects to give them a magnetic pole. Typically magnetizing something helps us get it out of the way or, possibly, lets us use it as a floating platform to advance through the level. 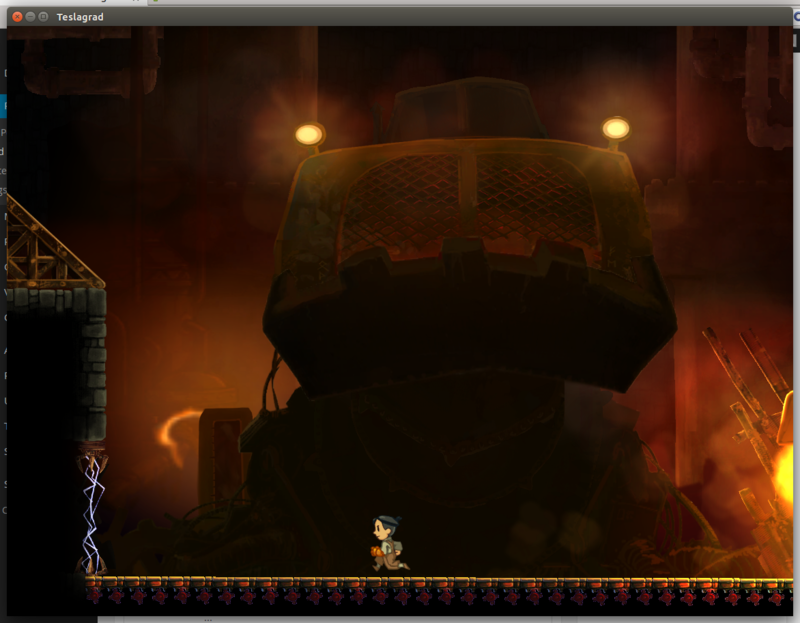 I really like the style of game play presented in Teslagrad. The game does not feature many enemies, most of our adventure is a combination of platforms and small puzzles. The game uses basic science to solve challenges and I think the game walks a fine line between entertainment and education. My only complaint from playing Teslagrad, and it is a fairly minor issue, is that I could usually figure out how to accomplish a goal, but the goal itself was not always clear. We are not given much in the way of objectives or direction, we are more or less left to wander as we like through the levels and I did not get the impression my character had a specific quest in mind. I was not sure if I should be collecting things or looking for something or if my objective was to simply keep moving to the right-side of the level. As an example of the ambiguity, in the first level we come to a room where boxes fall from the ceiling and are moved across a conveyer belt into a furnace. When we enter the room, the door closes behind us and a giant mechanical monster appears. What do we do? My first thought was to magnetize the falling boxes, form a platform and get up onto a ledge which I hoped led to the next room. This worked, but there was a door blocking the passage into the next area, I had to stay and do something. My next thought was Tesla was known for working with machines, so maybe I could feed boxes to the mechanical monster and befriend it. At first this went well, I got the monster to eat a bunch of boxes, but then it breathed fire and killed me. Eventually, I figured out that I would have to feed the monster and dodge out of the way and keep doing so as things got increasingly hectic in the room. This example, I feel, demonstrates two important points about Teslagrad: 1. The game is pretty open and invites problem solving. 2. The game can be vague as to the nature of some puzzles. Overall, I feel Teslagrad is a good game. It starts out easy, adds more challenges and scientific concepts as it goes and manages to be both challenging and, at times, thoughtful. The game is available on Steam as a free demo and, if you like the experience, you can purchase the full version. I believe it is well worth a look as it is a strong addition to the puzzle/platform genre.